Chapter 1: Expectations. This expert recommendation is part of a series on helping students engage productively in active learning classrooms. When students encounter an active learning classroom, they may be unsure of what is expected of them. They may fear they won’t be evaluated fairly, or won’t see a clear path towards success. This anxiety and uncertainty can cause them to withdraw from interactive learning activities. This chapter focuses on helping students engage productively in active learning classrooms through creating clear expectations for student engagement and learning. How do expectations affect student engagement? When students don’t know how to be successful in your course, including what will be expected of them in an active learning context, they may be anxious or resistant. Students often feel that active learning requires more of their time and effort (Ellis, 2013) and may not aware of the advantages of this teaching approach (Seidel and Tanner, 2013). They may feel anxious in this unfamiliar environment (Slezak, 2014; Jackson and Trees, 2003) and fear that their grades will suffer (Ellis, 2013). Such anxiety has a negative impact on student performance (Moreno, 2009), as well as student engagement in any given activity (Nguyen et al., in press). In one study, when instructors explained the purpose of active learning activities, students placed higher value on those activities, reacted to them more positively, and evaluated the course more favorably (Nguyen et al., in press). So, to get off on the right foot, explaining the value of active learning can go a long way towards promoting student engagement (Fredericks, Blumenfield and Paris, 2004). Below are several other elements to be taken into consideration. Student expectations need to be calibrated early. Students may enter the classroom with a range of expectations based on prior experiences. Making it clear what this course will be like, what participation will be expected (preferably by jumping into active investigations), and how students will be evaluated, will help to set clear norms for engagement (Gaffney, Housley Gaffney and Beichner, 2010; Gaffney and Whitaker, 2015). Students need to feel that they will be evaluated fairly. Students want to know how grades will be calculated, and that their grade will reflect their own work (rather that of their classmates; Ellis, 2013). Thus, communicating clearly how students will be evaluated is critical. Students also need to have a certain amount of faith that you are fair and honest; this kind of credibility can be built over time by being open to questions, building rapport with students, responding to their concerns, and transparently discussing your decisions (Witt & Kerssen-Griep, 2011; Gaffney and Whitaker, 2015). Students need to know how to succeed in the course. Students are more likely to work hard on something if they feel that it will lead to success (“outcome expectancy”; Moreno, 2009; Boekaerts, 2010). Students must believe that engagement in active learning will directly improve their performance in the course, as well as have accurate expectations about how to earn good grades. Additionally, clarity of instructions is important in active learning classrooms: What is the purpose of the task? Why will students be working together? Without this clarity of intention, students may feel bewildered and a lack of direction (Patton, 2010). Lastly, students can be overconfident in their abilities, leading them to minimize the benefit they can get from active learning. Often, overconfidence is strongest among weaker students (Karatjas, 2013); this lack of ability to see one’s own flaws is called the Kruger-Dunning effect (Kruger and Dunning, 1999). Regular, clear feedback on student performance (using some low-stakes assessments) is thus critical for students to develop clear expectations and avoid overconfidence (Pintrich, 2003). It's important to calibrate student expectations, from the first day (Gaffney and Whitaker, 2015), but don’t stop there. Student expectations are malleable, and can shift over the duration of the course (Gaffney, 2010). Below we describe early approaches, as well as strategies that can be used throughout the term. By attending to a few of these strategies, you will be able to foster a classroom where students are less anxious about their grades and recognize the benefit of engaging in active learning for their academic success. Let your students know why you’re using the approaches that you’re using, and help them see the value in them, but try to avoid lecturing about how active learning is good for them. This “eat your vegetables” approach has sometimes been associated with student resistance (e.g., Smith, 2008), likely because students feel that they are being told what to do that they don’t have ownership of their own educational process (Reeve, 2009). (See Chapter 3: Motivation for more about the importance of student ownership). Below are some ways to be explicit about your pedagogical choices. You might explain the rationale for your use of active learning, and how this pedagogy aligns with research. Hear from several seasoned instructors in this 5-minute video on laying out the course approach. Here are Sample Slides Explaining Active Learning (PPT), and a video of an instructor discussing his use of clickers with the class, and a Tutorial and Clicker FAQs handout from CU Boulder. However, I have heard instructors report that such a didactic approach can backfire, and so it may be best to partner such explanatory approaches with active learning (e.g., see our Clicker Questions – How Do You Learn? (PPT)), or as a reflection after the activity, to avoid students feeling lectured to. Invite discussion about the course approach. Invite discussion after you have described the course approach. E.g., “What are your thoughts about the approach described? How does this match your own approaches to learning? What questions do you have? What will you/I need to do for this to work?” Return to these ideas later in the course; student may not necessarily remember this introduction (Tosh et. al, 2005). Note too that you will want to have a clear rationale in your mind for using active learning in order to be able to clearly communicate that rationale to your students! One particular strategy is to use humor to show that learning is typically limited with traditional lecture, and hold a reflective discussion about how unsatisfying this traditional course structure can be, and what you and the students can do to avoid such an outcome. For example, you can do a parody of traditional lecture, and show a video of an instructor teaching a dance class via lecture (see the activity Traxoline and Dancealot), leading to a frank and collaborative discussion of the course approach and how it can best support students’ learning. Ask students what they expect in the course, and respond honestly and respectfully to any concerns. For example, solicit rumors about the course or pre-existing ideas about the content or fears of math or science (see the activity Rumors). This strategy creates positive expectations and establishes your credibility. However, set realistic expectations about how much say students really have in the course structure (Slezak, 2014), and trust in your curriculum – especially on the first day. Ask students to reflect on their learning strategies and goals. Ask students about how they can best achieve their personal goals for the course, steering the discussion towards the utility of engaging in higher-level learning activities in class. In the First Day Questions activity, we give examples of how instructors ask students about their study strategies and personal goals – and how best to achieve them. Include information about teaching strategies in the syllabus. However, we don’t recommend reading the syllabus on the first day; instead, consider using an interactive Syllabus Quiz, where students read and discuss questions related to the syllabus, including often neglected issues such as ethics and cheating. Also, hear from several seasoned instructors in this 2-minute video on dealing productively with administrative issues on the first day. Beginning the semester with active learning strategies from the very first day sets clear classroom norms and aligns your first day activities with the actual structure of the course (Gaffney and Whitaker, 2015). The challenge can be to find an activity in which students can engage, which does not require content knowledge. Below are some suggestions. Discuss the course approach or goals. As described above, you can use an active learning approach to discussing the course structure and purpose, through activities such as Traxoline and Dancealot. You can also discuss why the course is relevant for student lives and careers – see several examples in the Why Study [Your Course] activity. Such activities serve the dual purpose of discussing the reason and rationale for the course, and setting accurate norms for engagement. Hear from several seasoned instructors in this 5-minute video on establishing expectations for participation. Open the floor for questions. Invite students to ask questions and spend the first day answering any question, even crazy questions, about your subject (see example activity Ask Me Anything). This establishes your credibility and creates rapport with students. Engage students in accessible course content. There are several ways to jump into course content without requiring prior knowledge. You might ask students to solve an estimation problem in a group (see example activity Fermi Questions), or use an activity on the nature of science (examples: Nature of Science activities, Make a Paper Airplane, or several geoscience examples that could be adapted for other disciplines). It is also critical that students know how to do well, because they will feel that they are in charge of their own learning (see Chapter 3: Motivation for more about the importance of ownership). As stated earlier in this chapter, student resistance often stems from anxiety about grades. Below are some strategies for ensuring that students know how to be successful. Share success strategies from past students. It can be very useful to discuss the types of student behaviors that typically lead to success (Moore and Jensen, 2007). One approach is to show common student responses about strategies for success, such as preparing for class and interacting with other students. See Advice to Future Students for an example. If you use Learning Assistants, those LAs can also provide such advice as undergraduate peers. Show your learning goals for students at the beginning of the course, and at the start of each lecture. Align your assessments to these goals, and make sure students understand how assessments will be graded. To communicate expectations on a particular task, use a simple grading rubric. To help them better internalize your expectations, you might give students examples of good and bad academic work, and then ask them to grade the examples based on that same rubric. Make these rubrics public before the activity that they will be used to evaluate. You can gradually wean students from such rubrics over time, once these expectations are established (Seidel and Tanner, 2013). Within the first few weeks, give an assessment that counts very little towards the final grade. This assessment can improve student confidence, and clarity on course expectations, without significant risk to their grades (Ellis, 2013). It will also demonstrate how future work will be assessed For example, use the first homework or a mini-quiz to demonstrate how assignments will be graded, or how a rubric will be used. Clear, individual feedback is one of the most essential ingredients to student learning (Pintrich, 2003, Moreno 2009). This feedback should be clear and accurate, to help students develop a clear sense of how well they are mastering the material. Feedback should also include recommendations on how to improve in the future. This can be done on individual work, or in feedback to the class as a whole. You may also want to show students grade distributions (from the current and past courses), to allow students to properly manage their grade expectations. (Moore and Jensen, 2007). However, be careful of inappropriately setting students up for competition with one another, and realize that many students will (incorrectly) place themselves in the top part of the distribution. Consider metacognitive strategies (see Chapter 2: Metacognition) to help students reflect accurately on their own performance. You may want to avoid open-book exams, which may falsely inflate students’ confidence (Moore and Jensen, 2007; Jensen and Moore, 2008). 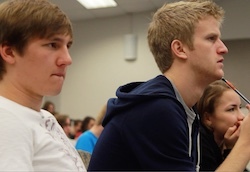 Students may feel anxious when presented with group learning opportunities, as the familiar routine of traditional lecture has been disrupted. Help ease the transition with a few of the following strategies to set clear expectations for working in groups. With a clear, consistent routine, students will know what is expected of them and feel more comfortable (Slezak, 2014). For example, you might start each day with a clicker question related to the last class, go over student comments to the pre-class preparation activity, lecture for a short time, and then begin an active learning exercise. Or, you could begin with a group problem or other active learning exercise. Structure the groups for success. Use an early, engaging activity that requires students to work together, such as an easy Nature of Science activity. This builds successful collaboration early in the course, and helps to avoid isolated students who aren’t part of a group. Also see our Group Skill Building activity for suggestions on forming the first groups, and Chapter 7: Group Work for more suggestions on structuring group work and tasks for engagement. Provide clear goals and instructions for tasks. Give clear instructions about the purpose of the task and what they will be doing, to mitigate any sense of aimlessness (Patton, 2010); the purpose of learning tasks is often clearer to the instructor than the students! Make sure your instructions on the task itself (e.g., written directions on the worksheet) are clear – again, this is an area where we, as educators, can often improve. When students encounter an active learning classroom, they may be unsure of what is expected of them. They may fear they won’t be evaluated fairly, or won’t see a clear path towards success. This anxiety and uncertainty can cause them to withdraw from interactive learning activities. So, to get off on the right foot, explaining the value of active learning can go a long way towards promoting student engagement. Let your students know why you’re using the approaches that you’re using, and help them see the value in them, but try to avoid lecturing about how active learning is good for them. Explain to students why you have chosen to teach this way. Highlight the shortcomings of traditional lecture. Solicit student ideas about the course. Ask students to reflect on their learning strategies and goals. Beginning the semester with active learning strategies from the very first day sets clear classroom norms and aligns your first day activities with the actual structure of the course. The challenge can be to find an activity in which students can engage, which does not require content knowledge. Discuss the course approach or goals. Open the floor for questions. Engage students in accessible course content. It is also critical that students know how to do well, because they will feel that they are in charge of their own learning. Student resistance often stems from anxiety about grades. Share success strategies from past students. Students may feel anxious when presented with group learning opportunities, as the familiar routine of traditional lecture has been disrupted. Provide clear goals and instructions for tasks. Gaffney J. and Whitaker, J. T., Making the most of your first day of class, The Physics Teacher. 53, 137-139 (2015). Gaffney, J. D., & Housley Gaffney, A., & Beichner, R. J., Do they see it coming? Using expectancy violation to gauge the success of pedagogical reforms, Physical Review Special Topics-Physics Education Research. 6(1), 010102 (2010). Jackson, M., & Trees, A. Clicker implementation and assessment. Boulder, CO: Information and Technology Services and Faculty Teaching Excellence Program, University of Colorado. (2013). Karatjas, Comparing College Students’ Self-Assessment of Knowledge in Organic Chemistry to Their Actual Performance, J. Chem. Educ. 90, 1096−1099 (2013). Kruger, J.; Dunning, D. Unskilled and Unaware of It: How Difficulties in Recognizing One’s Own Incompetence Lead to Inflated Self-Assessments, J. Pers. Soc. Psychol., 77, 1121−1134 (1999). Jensen and Moore, Students' behaviors, grades and perceptions in an introductory biology course, The American Biology Teacher. 70 (8) (2008). Mazur, E., Peer Instruction: A user's manual. Upper Saddle River, NJ. Prentice Hall, (1997). McCroskey and Teven, Goodwill: A reexamination of the construct and its measurement, Communication Monographs. 66, (1999). Moore and Jensen, Do open book exams impede long term learning in introductory biology courses?, College Sci. Teach. 36 (7) (2007). Nguyen, K., Husman, J., Borrego, M., Shekhar, P., Prince, M. Demonbrun, M., Finelli, C. J., Henserson, C., Waters, C. (in press). Students? Expectations, Types of Instruction, and Instructor Strategies Predicting Student Response to Active Learning, International Journal of Engineering Education. Smith, G.A., First-day questions for the learner-centered classroom, Nat. Teach. Learn. Forum. 17(5), 1–4 (Sept. 2008). Shekhar, P., Demonbrun, M., Borrego, M., Finelli, C., Prince, M., Henderson, C., & Waters, C., Development of an observation protocol to study undergraduate engineering student resistance to active learning, International Journal of Engineering Education. 31(2), 597-609 (2015). Tosh D, Light TP, Fleming K, Haywood J., Engagement with electronic portfolios: Challenges from the student perspective, Canadian Journal of Learning and Technology. 31(3) (2005).